What can I say I guess I have stripes on the brain. At $250+ it's not in everyone's budget. You can either add yellow trim to it yourself or get a coverlet/comforter/blanket in a yellow shade to fold up at the bottom of the bed. The look for less duvet set ranges from $25-$35 and the pop of yellow comforter ranges from $19-$24. i love that dwell bedding! i've seen it before but i couldn't remember who made it... thanks!!! 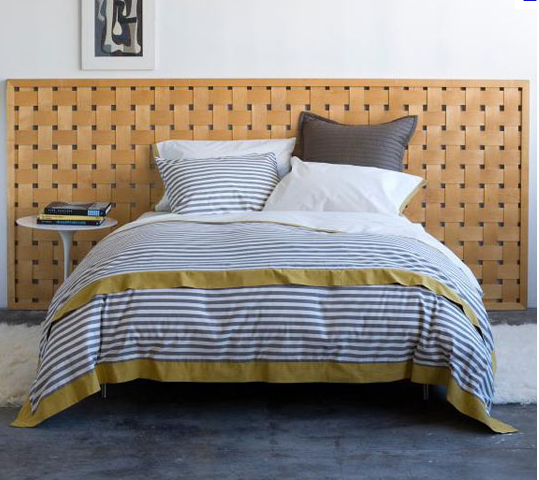 Oh, I've loved that striped dwell bedding for sooo long now. I need to get me some before they stop selling it. Fun post! What a great deal! This is definitely luxe for less! 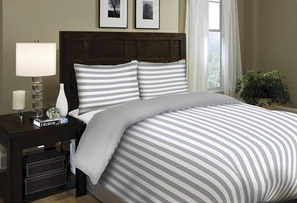 I love this white and gray striped bedding! LOVE that bedding! The colors are so relaxed and just perfect for a cozy bedroom. Camila - Gorgeous. Every bedroom needs some stripes!